English Heritage took the bold step to recover one of the lost views within Repton's designed landscapes at Kenwood. The site sits on the Highgate Ridge - along the high ground in north London - and once enjoyed long views down to the City and St Paul's. Also on the ridge are the pond beside Jack Straw's castle at Hampstead and Alexandra Palace. From these sites there are panoramic views across London, stretching out towards Shooter's Hill above Greenwich and as far as Crystal Palace - the whole Thames Basin revealed. Each of these sites, 'works of art' in their own right, used the topographic setting to great advantage, particularly these stunning borrowed views of the landscape beyond the direct ownership of each site. Built in the late eighteenth century as part of the remodelling of Kenwood's ferme ornée, the Dairy is part of a programme of 'events' within the home park. Like Marie Antoinette's dairy at Versailles, it was for fun and 'show' as much as for actual practicality. The pretty regency building is also an 'eye-catcher' seen from the House and, from the Dairy itself, offers a prospect of the meadows and lakes at Kenwood and of the long views out across the city. Until this year this long view was cut off from the overall designed park. As part of the planning process to re-open the views to and from the Dairy, English Heritage engaged in a public consultation to gauge opinion on their plans to clear trees and to reveal the lost views. The public chose to ask English Heritage to save three Copper Beech trees on the slope immediately below the Dairy - with unfortunate visual results. 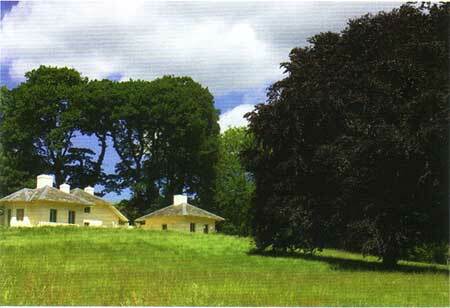 The Beech trees are bluntly dominant and undermine the original design of the ornamental setting for the Dairy / ferme ornée. They are so large, dark and looming that the whole effect of the design is lost - visual tricks that made this part of the landscape look bigger than it actually is are destroyed. In conservation of historic buildings or pictures it is accepted practice to remove 'accretions' - later additions that overlay and obscure the original design concept. This practice has been applied to great effect to designed landscapes, showing that revealing the original design can enhance enjoyment of the place and increase biodiversity by restoring a mosaic of habitats in place of unplanned, unmanaged overgrowth that is, effectively, a monoculture that is often low in biodiversity value. At Stowe the National Trust has taken very advanced steps to remove unplanned tree and scrub growth from a network of picturesque parts of the landscape garden revealing views, intimate spaces and paths that provide a great variety of habitats. Allowing unplanned vegetation to persist and arguing for its retention is equivalent to spray-painting a Great Master or scribbling over a Hockney drawing. The People's Choice at Kenwood was to keep three trees and to scribble over one of Repton's great masterpieces.